Senior figures within the global cotton industry are considering promoting sales of their fibre proactively for the first time, as price shifts are allowing synthetics to seize more market share. Kevin Latner, president of Cotton Council International, argued at the International Cotton Advisory Committee's (ICAC) 72nd plenary session in Colombia for the industry to persuade consumers that cotton is a sustainable and quality fibre. "We know that consumers prefer cotton, but we need to do a better job of communicating the social and environmental benefits of natural fibres to them directly," he told the meeting last week. Speaking to just-style later, the ICAC's executive director Terry Townsend explained that the push in the US and the European Union (EU) to develop biofuels had created a structural change in agricultural production, lifting average cotton prices from around US$0.60/lb in 2006 to US$0.90/lb today. Synthetic prices have also risen, but not as much - and today often hover around the US$0.76/lb mark. Many retailers and manufacturers began swapping cotton for synthetics several years ago in an attempt to keep costs low in the face of historic cotton price highs - yet have continued with these fibre substitutions. "Cotton is no longer price competitive," he said. Latner explained that over the past five years, cotton has lost 7% of its fibre market share, and 12% in textiles market share. And while cotton industry organisations have until now focused on improving supply, quality and related production issues, the ICAC meeting heard that "the industry needs to be concerned about demand," according to Townsend. However, if ICAC moves ahead in this direction, how? The committee is not, noted the executive director, "a promotional advocacy organisation," and so would have to hire PR staff or advisors. There were calls at the meeting in Cartagena for the ICAC to take on such work directly, along perhaps with the International Forum for Cotton Promotion (IFCP), and national cotton organisations - maybe promoting the fibre in their own national markets. Latner had earlier led a Task Force on the Challenges from Competing Fibres, and was presenting a report on its findings. He argued that cotton has an "invaluable story of creativity, innovation, quality and in general being a better product than competing fibres". He said that to improve cotton's value in the market, consumers need to know what they are buying - hence labelling should be promoted. And the cotton industry needs "to promote the social and environmental benefits of cotton". He argued that the sector should be optimistic that promotion would work, since task force research "showed that consumers really love cotton and there are excellent products for consumers." Indeed, studies showed that in some countries, such as in the US, Europe, Japan and Brazil, 90% of consumers prefer cotton to other fibres, he added. A senior economist at ICAC, Dr Alejandro Plastina, noted at the meeting that the market share of cotton declined from about 50% in the 1980s and the early 1990s to about 40% in the early 2000s, and dipped to 29.8% in 2012. 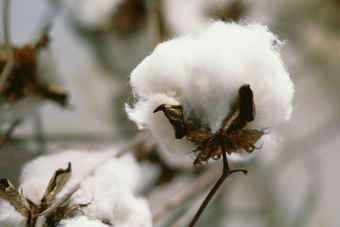 "The ICAC secretariat forecasts that with a stronger demand for cotton from industrial countries and assuming that cotton does not loose further price competitiveness to other fibres, the market share of cotton will remain stable at around 30% until 2014," said a note from the committee.